VANCOUVER, British Columbia -- Jannik Hansen scored the tiebreaking goal with 5:03 remaining and the Vancouver Canucks snapped a nine-game losing streak by beating the San Jose Sharks 4-2 on Thursday night. Daniel Sedin and Bo Horvat scored in the first period and the Canucks rebounded after blowing another late lead to avoid matching the longest losing streak in franchise history. Markus Granlund added an empty-net goal and Ryan Miller made 32 saves to help Vancouver earn its second win in San Jose in March. Patrick Marleau and Logan Couture scored for the Sharks, who lost for the 22nd time at home this season and will now likely have to open the playoffs on the road. San Jose is five points behind Los Angeles and four back of Anaheim in the Pacific Division with the Kings having one game in hand and the Ducks two. 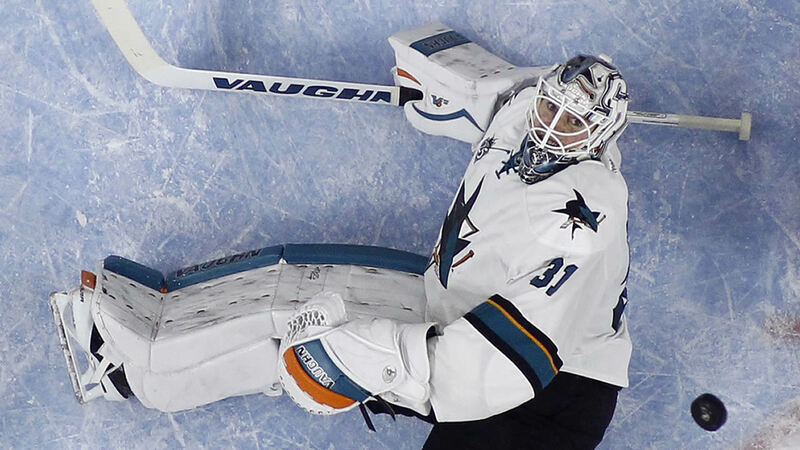 Martin Jones made 22 saves. The Canucks appeared on their way to losing their 13th game this season when leading after two when Couture tied the game midway through the third. He took a pass from Brent Burns at the side of the net and beat Miller for his fourth goal in two games this week against Vancouver. But shortly after that, Burns couldn't handle a pass from Joe Thornton in the offensive zone. The puck deflected off the boards right to Hansen, who skated in on a 2-on-1 and beat Jones for his 20th goal of the season. The Canucks took advantage of a pair of giveaways from Joonas Donskoi to score twice in the first period. After the first in the neutral zone, Jannik Hansen fired a shot on net that Jones kicked out right to Daniel Sedin for the goal into the open net just 1:09 into the game. Then with the Sharks controlling play, Donskoi lost the puck in the offensive zone and gave it right to Horvat, who skated in and beat Jones on a breakaway to make it 2-0. The Sharks got one goal back in the second on the power play when Marleau one-timed a pass in the slot from Thornton to make it 2-1.